India on Monday told the International Court of Justice (ICJ) that immediate steps must be taken to stop Pakistan's from carrying out the death sentence of former Indian naval officer Kulbhushan Jadhav. Noted lawyer Harish Salve, representing India, told the court that India couldn't arrange for defence aide to Jadhav due to the denial of consular access by Pakistan. He said India made innumerable requests for consular access but Pakistan refused to provide documents relating to the case and consular access to him. "Jadhav was framed on confessional statements extracted from him when he was in Pakistan's military custody," Salve said. 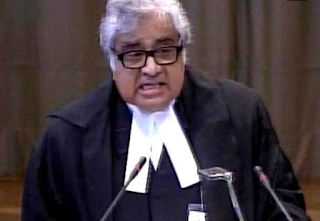 Demanding provisional measures to stay Jadhav's execution, Harish Salve gave instances as to when the International Court of Justice ordered provisional relief to death row convicts pending trial in the ICJ. He told the court that it is imperative to prevent irreparable damage to Jadhav's rights. Refuting the allegations levelled on Jadhav by Pakistan, Salve argued that India's case is that throughout his incarceration, Jadhav was denied consular access. Salve told the court that Jadhav's tape was doctored. Asserting that India relies on the Vienna Convention, Salve argued that the Vienna Convention doesn't provide any exception as to providing consular access. Salve citing Nicaragua, Germany and Mexico's examples said that India seeks annulment of death sentence announced by Pakistan's military court for Jadhav. "Pakistan's conduct violates the Vienna Convention. The more serious the charge, the greater the need for procedural safeguards to protect the rights of the accused," Salve told the court. Salve raised doubts over Pakistan military court's impartiality, saying that Jadhav's appeal was heard by a military court, presided over by a two-star general, whereas his death sentence was confirmed by a four-star general.